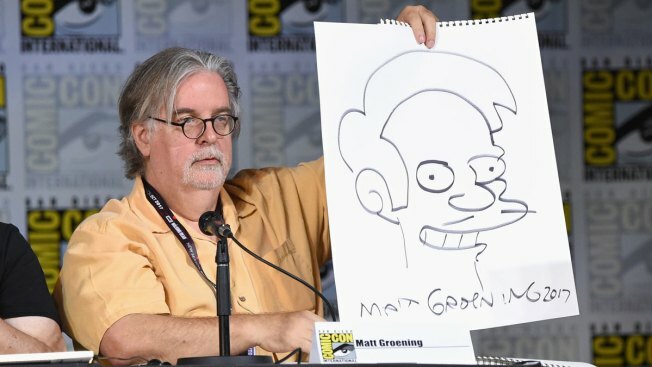 Writer/producer Matt Groening attends "The Simpsons" panel during Comic-Con International 2017 at San Diego Convention Center on July 22, 2017 in San Diego, California. "The Simpsons" creator Matt Groening waded into the muddy waters surrounding his animated character Apu during an interview with USA Today... and basically shrugged. "I’m proud of what we do on the show. And I think it’s a time in our culture where people love to pretend they’re offended," Groening said. The animated character Apu Nahasapeemapetilon is a Kwik-E-Mart owner introduced on the show in the 1990s. It was recently the subject of Hari Kondabolu's TruTV documentary, "The Problem With Apu," which argued Apu perpetuates a harmful stereotype of South Asian people. Groening's reaction is a far cry from that of Hank Azaria, the actor who gives voice to Apu. "It has come to my attention more and more--especially the last couple of years, as you say--that people in the South Asian community in this country have been fairly upset by the voice and characterization of Apu," Azaria said during an appearance on Stephen Colbert's "The Late Show." Azaria added, "The idea that anybody who is young or old, past or present, was bullied or teased based on the character of Apu, it just really makes me sad. It certainly was not my intention. I wanted to bring laughter and joy with this character. The idea that it's brought pain and suffering--in any way--that is used to marginalize people, it is upsetting. Genuinely." Azaria went on to say he would be willing to step aside from voicing the character. Kondabolu reacted to Groening's non-response on social media.